Overview: So, picture you are Gerry Conway. You’ve just written the storyline that killed off Peter Parker’s girlfriend, Gwen Stacy, which shocked the world in an era with no spoilers or Previews magazine. How the heck are you going to top that storyline? By bringing Gwen back to life. What?!?! With that, let’s dive into Essential Spider-Man Vol. 7. There are 25 comics collected in this volume, and a lot of great 1970s villains show up here, such as the Grizzly, Cyclone, and Mirage. We get classic returns by Doctor Octopus (still hoping to wed Aunt May), the Sandman, and the Shocker. But this volume is dominated by the first clone saga, which runs through the first half of this book. Many new characters join the Peter Parker universe in this volume. Glory Grant is introduced to us as a neighbor of Peter’s in his apartment building. She is a would-be model looking for work, and Peter helps her get a job at the Daily Bugle as J. Jonah Jameson’s secretary. Also at his new apartment, Mamie Muggins is the landlord, who would constantly torment Peter for his past-due rent. What makes this Essential? : This volume is a love-it-or-hate-it edition – no trying to straddle the line with this collection. 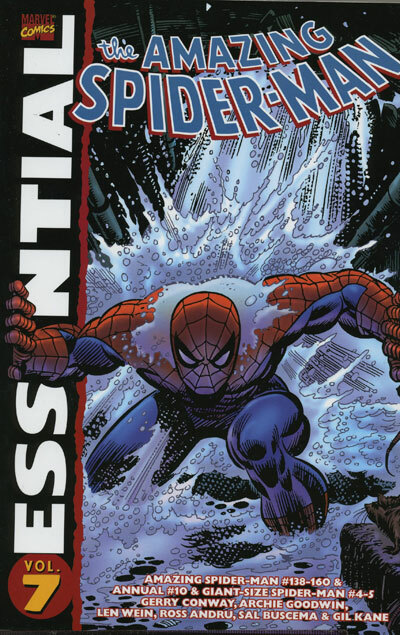 This Essential is dominated by the first clone saga, which would influence the biggest Spider-Man storylines in the 1990s. That 1990s story is extremely polarizing among all comics fans from that era. If you liked Ben Reilly and the new direction of Spider-Man in the 1990s, then this Essential is a must own. If you abhor all things about the clone storyline, then you may want to skip this collection. One thing I will say in defense of this volume: It’s in these issues that we see Peter Parker start to develop a romantic relationship with Mary Jane Watson. For years, she had been the cute girl-next-door that was a good friend to Peter, but they were always romantically attached to others. Following the events in the last Essential volume, we see Peter and Mary Jane spending more time together as a couple. Footnotes: Giant-Size Spider-Man #4 is also reprinted in Essential Punisher Vol. 1. If you like this volume, try: tracking down a copy of Superman vs. the Amazing Spider-Man from 1976. This is the first official inter-company crossover between Marvel and DC, initially released as an oversized tabloid edition for the lofty sum of $2.00. (It has been reprinted in at least two of the Crossover Classics collections.) Having worked on both title characters in the past, writer Gerry Conway and artist Ross Andru were tasked with bringing the two icons together in one story. Following another defeat which lands him back in prison, Lex Luthor meets Doctor Octopus, and the two team up to escape their captivity and get revenge on their nemeses. Through the convenient misunderstanding, Superman and Spider-Man find themselves facing off against each other, before realizing the mistake and directing their energies against the true foes. This really was a huge event at the time, and it should hold a place in some format in your collection. This entry was posted in Marvel Essentials, Spider-Man and tagged Archie Goodwin, Gerry Conway, Gil Kane, Len Wein, Ross Andru, Sal Buscema, Spider-Man. Bookmark the permalink. Pingback: Throwback Thursday – Essential Spider-Man Vol. 7 – WORST. COMIC. PODCAST. EVER!